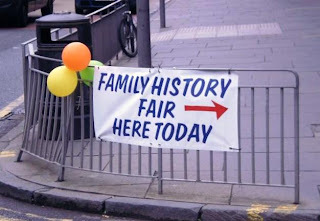 Yesterday was the 22nd annual conference of the Scottish Association of Family History Societies (www.safhs.org), hosted by the Scottish Genealogy Society (www.scotsgenealogy.com) in Chambers Street. There were many vendors present and four main talks given, with some shorter lunchtime presentations. Travelling through from Largs, I missed the first talk on Edinburgh resources, but my main reason for attending was to hear the second and third talks, by Tristram Clarke of the National Records of Scotland (www.nrscotland.gov.uk) and Andrew Nicoll of the Scottish Catholic Archives (www.scottishcatholicarchives.org.uk); the fourth by Duncan MacNiven was on the 1911 census, which I did not attend, as I heard him talk on the same census at the last SAFHS conference! Both Tristram's and Andrew's talks were on religious topics, with Tristram dealing with the Scottish Episcopal Church and Andrew the Scottish Roman Catholic Church. Both were excellent, though ironically I think that I personally learned more on the latter than the former, having expected it to be the other way around. Tristram gave a fantastically well illustrated talk on the episcopal church, concentrating on its history from the Glorious Revolution onwards (rather than on the mainstream Kirk's various episcopal periods beforehand). This showed how the initial records remained similar to those of the Presbyterian Kirk, but changed as the new episcopal church progressed. It was interesting to note that non-juror ministers often did not baptise children as it was illegal for a time, and other points such as the aftermath of the 45 rebellion,when the 'piscies' could not worship in congregations of more than four people to one minister, having followed the Jacobite cause. It was also interesting to discover the nature of some congregations, from weavers in Girvan to English iron workers in Airdrie and hatters from Lancashire in Greenock. At one point Tristram discussed records from Muthill in Perthshire and quoted a baptism from someone resident at Bellyclone. I have McEwan family from Bellyclone, and a CD with the episcopal records for Muthill, so need to have another look at this part of my tree with a fresh eye. Excellent stuff. Tristram is currently updating the essential NRS (previously NAS) guide "Tracing Your Scottish Ancestors", which I think I am right in saying should be out later this year. Definitely a key guide for Scottish researchers, detailing the collections held at the NRS. Andrew's talk for me was more revelatory though, in that although I knew about the new records recently launched on ScotlandsPeople (www.scotlandspeople.gov.uk), I wasn't so aware of the project that had actually led to their going online. There were two big revelations for me - I had assumed that the registers now online were the same as those previously available at the National Records of Scotland in photocopy format. In fact, whilst there were 250 registers available in the NRS, there are now in fact some 600 registers hosted on ScotlandsPeople, following a four year project to draw them all in from across the country. Amongst the new holdings, for example, is a register from Eigg going back to 1842. Moral of the story - if you previously drew a blank at the NRS when looking through Catholic registers and assumed it wasn't worth trying the online collection, have a rethink! The other big surprise was to note the existence of the Catholic Heritage website (www.catholic-heritage.net) site, which has an online catalogue of the Scottish Catholic Archives - I knew of the SCA's own website (see above) but I'd never heard of the other - what a resource! It also includes material from England and other countries, so worth a look if your Catholic heritage extends beyond Scotland. One other item clarified was the extent to which Scottish Catholic records can record an Irish place of origin - from what I now understand this is mainly for Greenock and Glasgow in the early pre-famine part of the 19th century. Andrew is currently updating the help material for the Catholic records on the ScotlandsPeople site, so look out for this in the near future. 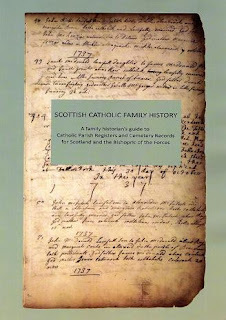 And at last - there's a definitive guide to Roman Catholic records in Scotland, written by Andrew and just published, entitled "Scottish Catholic Family History". I have a copy, and it is just brilliant, and will certainly soon get me up to speed on one aspect of Scottish genealogy I am not quite so familiar with, despite my Catholic wife's constant attempts to throw holy water over me! The book is published by The Aquhorties Press in Edinburgh, the SCA's publishing arm (ISBN 978-0-9557591-7-8), and costs £10 - not sure yet where to obtain it from, but I will publish a review soon in Discover my Past Scotland (www.discovermypast.co.uk) and hopefully have more then (or try the SCA for more info). Then it was time to do the rounds - I caught up with fellow professional genies Carolynn McNicholl, Kirsty Wilkinson, Ali McDonald and the magnificent Maxwells, Graham and Emma, from the Borders! Carolynn recently joined ASGRA, and so I caught up on her experiences there (and shared the train back to Glasgow with her!) - her blog is at http://scotgen.blogspot.com. Kirsty has posted her thoughts on the event, and also news of a personal disaster on record keeping today, at http://professionaldescendant.blogspot.com/2011/06/preserving-personal-papers-cautionary.html - there's a clear case of a damsel in distress, if anyone can help sort out mouldy documents and certificates, please read her post! Ali is still ploughing away on the Scottish DNA project (and currently studying for a masters), and working hard in his capacity as Scottish representative of FamilyTree DNA (see his blog at http://scottishdna.blogspot.com), whilst the Maxwells continue to genealogically colonise the Borders with some amazing new transcriptions publications and a new binding service for family history reports, as well as the ongoing project to provide free access to early Borders censuses linked online to NLS maps in Edinburgh (see www.maxwellancestry.com). I also met up with Nicola Osborne at Addressing History - some exciting news here with an extension to the original project now underway with post office directories from Glasgow and Aberdeen (see http://addressinghistory.blogs.edina.ac.uk/2011/05/27/an-update-on-development-and-a-super-blog-post-on-historical-affluence-in-edinburgh/). Deceased Online (www.deceasedonline.com) was also on hand with its new release of 300,000 records for Edinburgh under demonstration, and with LOTS more to watch out for in the next few months, both from Scotland and also UK wide, whilst Helen Grant was there also from Scottish Monumental Inscriptions (www.scottish-monumental-inscriptions.com) with many new CD releases and more to come. David McNay from the Scottish Military Research Group gave me a peak at the Daily Record indexing project for the First World War, which looks great. David blogged from the event at http://scottishmilitary.blogspot.com/2011/06/safhs-conference-2011-live-blog.html - one thing he has pointed out is that there are several projects currently underway from the group, which is continuing to expand, but as ever they require volunteers to help with the transcriptions. If you have an interest in military history, do get in touch with David and the project. Elaine MacGregor from the Families in British India Society (www.new.fibis.org) was there also, in her first SAFHS show, providing help to those with Indian connections. I had chats with many other gene genies, including Dee Williams (ScotlandsPeople), Alison Wallace (Brightsolid), Pete Wadley (NRS), Sheila Faichney (Ancestral Tourism Marketing Officer for Angus), Ken Nisbet (SAFHS), Bruce Durie (University of Strathclyde), Bob Stewart (Lanarkshire FHS), Marie Dougan (Ancestral Consultants), Alison Spring (LDS Glasgow), Elma Lindsay (former Stirling archivist) and many others - apologies to any others if not named! My overall sense was that this was a busier conference than last year, with I believe about 150 conference delegates which I think was more than last year, and three floors filled with vendors, though this seemed to be busiest between 12 and 2pm. The scheduling was perhaps a bit unfortunate in that two other major events were also in play on the same day, the Armed Forces weekend in Edinburgh obviously drawing big crowds, and the York Family History Fair, one of the largest in northern England. The weather was also not great, so it was great to see it as busy as it was, all things considered, and I look forward to next year's - more info on that when I get it! Useful stuff, thanks for posting. One day soon I hope to pull back from my US research and look at Scottish family again. Thank you for the interesting summary. I wasn't there and this is a good way of finding out what went on. Thanks for the mention of my blog. When I was sitting in the audience yesterday tutting at the lack of respect with which certain Edinburgh records have been treated I had no idea my own 'archive' was in such distress (source now traced to a dripping pipe connected to the washing machine)! I enjoyed all the talks yesterday, especially the one on the Episcopal Church as I have recently been doing some research using Episcopal records (although from transcriptions only). Let us know if you find out where 'Scottish Catholic Family History' can be bought as I didn't get a chance to pick up a copy yesterday and haven't been able to find it online. Thanks for posting this Chris, great to meet up again yesterday in Edinburgh, I hope we'll manage to work together in Angus soon. chris, thanks for the plug about the scottish catholic family history guide. it really did just come off the press for the conference so i haven't updated our website yet, but it can be ordered from the scottish catholic archives - I'll get the details online on monday! Thanks Andrew, it's a great guide, and thanks also for such an informative talk! Sheila - will be in touch tomorrow! Too bad I'm so far away, I would have loved to have been there for the talks. I'm interested in what interesting sources there are for Edinburgh episcopal records. I know some records are held by the Edinburgh City Archives and some by the NAS, but others still seem to be held by the churches themselves, and I haven't had much luck trying to contact them. Hi Tunji, as with most denominations, some records have been published. On episcopal records, for example, I have a CD here reproducing an old printed copy of Muthill episcopal baptisms from 1697-1847. There is a list of additional transcribed and indexed holdings at the ScotlandsPeople Centre in Edinburgh available at http://www.scotlandspeoplehub.gov.uk/pdf/church-episcopal.pdf. Also, D. J. Steel's National Index of Parish Registers Vol. 12 has a list entitled Registers of he Scottish Episcopal Church (Appendix 2, p.244) which lists records he was aware of at the time of writing the book, which states "All registers are in the hands of the incumbent unless otherwise stated". This includes some notes of transcribed sources. Tristram did mention that some records are held in university archives and in county archives, so try SCAN and relevant university catalogues (mainly Aberdeen and Glasgow). An alternative source he mentioned were registers of confirmations (as with the Catholic church), kids usually being baptised circa 12 years of age (though it varied), which sometimes note where people were baptised. There are also rolls of the Scottish Episcopal Church Friendly Society from 1794 (I think at NRS). I was interested in records from St Paul's Episcopal Chapel in Aberdeen, some of which have been transcribed by both the Spalding Club and A Strath Maxwell (both these transcriptions are on the ScotlandsPeople list Chris linked to). Probably not much use to you if you can't get to Edinburgh, but both Edinburgh Central Library and the Scottish Genealogy Society library have a good collection of the available Episcopal transcriptions. No probs Carolyn, and thanks for being such good company on the train back! Until the next time...!